The next best thing to traveling is reading about it. Since our traveling adventurers are currently in the south of Italy, I found a few books in the library to help me picture their life there. One of them is My Calabria, by Rosetta Constantino. Part memoir part cookbook, Rosetta chronicles her family's roots through the recipes her grandmother cooked. Sharon, at My French Country Home recently wrote a post on French Onion Soup. Inspired by her post and by the recipe for Zuppa de Cipolla alla Casa Janca in Rosetta's book, I made Red Onion Soup for lunch today. The recipe's on my food blog, here. But just let me tell you, it's mellow, sweet, comforting, and perfect for a rainy (or snowy) January day. Have you ever wondered what other people REALLY think of your blog? Hopefully they like it, because really, with all the blogs out there, who would read one she didn't like, or even take the time to comment negatively? It's all about choice. But maybe there's something your readers REALLY like and something they overlook because the rest of your blog is so great. Heather, over at Inspire Me Heather, has come up with a brilliant idea. She has a linky party going on throughout the month of January where she will assign you two blogs to critique, anonymously, and two bloggers will critique your blog. 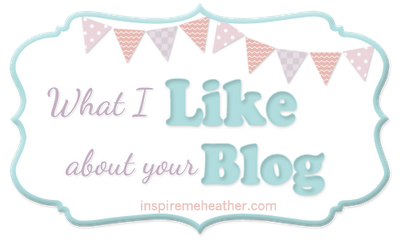 So go on over, sign up and find out what people really like about your blog! Oooops --- the second sentence should say: "...I gave myself *permission* to blog..., etc.". Maybe that was obvious. That soup looks delicious! I used to make a creamy onion soup with sweet onions, red onions, shallots and garlic, with a chicken stock base. I haven't made it in ages, but this makes me want onion soup in a bad way! Oh, and your previous post brought back such great memories! I loved looking out at Tod Inlet from Butchart Gardens, seeing the sail boats bobbing and reflections of the trees in the water ... that was a very special trip for us! This sounds amazing and perfect for the cold and dreary days. I love soups in the winter. I've been sorting out my kitchen cabinets and unearthed some French onion soup bowls. Perhaps I need to try this recipe. It looks delicious, Lorrie. I love French Onion soup, and have always wanted to try the Italian version. Thanks!! This soup looks delicious. I hope your travellers will be able to visit Cortona. Even if they don't - do check out "In Tuscany" by Frances Mayes from your library. It's filled with wonderful photographs and recipes! That soup looks beautiful - any recipe with "Italian" in it works for me! Yes, you must make the pumpkin cake - it is beautiful and also a crowd pleaser - it is best served with whipped cream, which helps to cut the tartness of the cranberries...it really is needed. I did not sweeten my whipped cream much. I joined Heather's linky party, even though I don't take criticism well. I'm trying to develop that grace - and the nerve too, because I often think that I just witter on and should stop blogging before I bore people to death. I think this soup looks so good, I have to try it! I was wandering around blogs and found you via another blog which is how it goes, what a lovely find.